Perched on the Aravali Hills are some beautiful Jain Temples that have attained fame all over the world. These Jain places of worship are one way to imbibe the spirituality and find bliss. In our 5N/6D Jain Tour in Aravali Hills in Rajasthan, we take you on a memorable journey where you get lifetime chance to witness some of the most magnificent Jain shrines in India. Perform a pilgrimage at the beautiful Dilwara Temple in Mount Abu that boasts greatly of its impeccable architecture. Then bow your head at the beautiful Ranakpur Temple near Udaipur that is dedicated to Lord Adinath and has Chaumukha (four-faces) design, which symbolizes that the Lord has conquested all four cardinal directions. We shall conclude this delightful sacred journey with the darshan of Rikhabdev Jain Temple, which is situated about 65 km from Udaipur on Udaipur-Ahmedabad Road. Post breakfast at the hotel, we shall fly to Udaipur. On arrival at Udaipur, our representative will assist to Mount Abu. 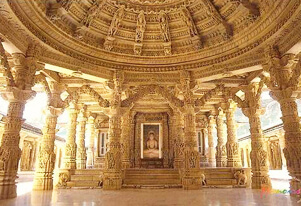 Upon arrival at Mount Abu, check-in at a hotel and visit to the famous Dilwara Temple. Overnight stay at Mount Abu. After the breakfast, we shall drive to Ranakpur. On arrival at Ranakpur, check-in at the hotel. In the afternoon, we shall visit Ranakpur Jain Temples. 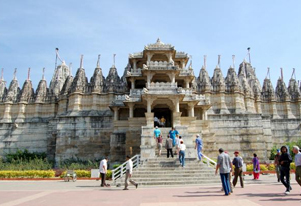 The renowned Jain temple at Ranakpur is dedicated to Lord Adinatha. The temple is designed as Chaumukha (four faces) and the quadrupled image symbolizes the Tirthankara's conquest of the four cardinal directions, hence the cosmos. Overnight stay at the hotel. Today, after the breakfast at the hotel, we shall drive to Udaipur. On arrival at Udaipur check-in at a hotel. Later visit Rikhabdev Jain temple. Rishabhadeoji of Rikhabdev Jain Temple is situated about 65 km from Udaipur on Udaipur-Ahmedabad Road. It is a well-known pilgrim site. The local Bhils are seen worshipping in this temple, where the main idol is of Digambar Lord Rishabh Dev, carved in black stone in Padmasana posture about 3.5 feet tall. Lord Rishabhadeo is also Kesariaji because a large offering of saffron (Keshar, a common ingredient in Jain rituals) is made to the deity. Overnight stay at the hotel in Udaipur. After the breakfast at the hote, we shall transfer you to airport/railway station for connecting flight/train for onward destination.